More Vietnam war films, and they get heavier and heavier. Yet, no matter how heavy it gets, I'm sure nothing compares to the actual Vietnam experiences of the war veterans. Platoon is one of the more famous films about the war in Vietnam, and is the only Vietnam film to win the Academy Award for Best Picture. It actually took home four Oscars (Best Picture, Best Director for Oliver Stone, Best Sound, and Best Film Editing). I, however, have a problem with the Best Editing award, as there were some transitions used that personally did not work for me. I actually counted three, though the ones that bothered me the most were one cross-dissolve (from the scene where they were smoking marijuana to a low-angle shot of the jungle treetops), and one fade to black, with the next fade in happening too abruptly. Anyway, that's just the editor in me nitpicking. But really, bad transitions always bother me. Though maybe it's the overall impact of the whole film that garnered it the Best Picture award. And I agree that the cinematic excellence of the whole film was enough to override those three lousy transitions. Written and directed by Oliver Stone, based on his actual Vietnam war experiences, the character-driven story shows Stone's screenwriting talent. I just hate Tom Berenger's character Sgt. Barnes so much. Not "hate" as in I didn't like Berenger's portrayal; I mean "hate" as in his portrayal was so effective that I wish he died earlier in the film. It was Berenger's character that killed Willem Dafoe's Sgt. Elias. How can you kill such a nice guy like Sgt. Elias? Anyway, Charlie Sheen in the lead role isn't half as bad. He was able to pull off an inexperienced cadet, straight from boot camp to the Vietnamese jungles. The kid has some acting chops, though not as great as Johnny Depp's whose character Lerner is the only one who can speak Vietnamese. Depp was actually supposed to play the lead role, but that role was eventually given to Charlie Sheen, since Depp wasn't as famous yet. But Oliver Stone correctly predicted that Johnny Depp would become a Hollywood superstar one day, and look at him now. Hollywood superstar. Just like Stone said. Also, I noticed that Willem Dafoe's face didn't change that much. Yes he looks older now, but he still looks like Willem Dafoe. I bet if he had a high school photograph, you could tell with one glance that it's still Willem Dafoe. And Forest Whitaker, too. Their faces don't change at all. Anyway, this film was shot---where else---in the Philippines, like its predecessor Apocalypse Now. And here's some trivia to all the Johnny Depp fans out there: prior to shooting this film, Depp has never been outside the United States. So the Philippines is the first foreign country he has visited, at the tender age of twenty-two. I just hope he didn't have any Claire Danes experiences here. 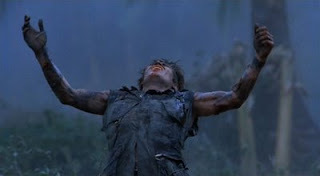 Willem Dafoe's classic arm-raising shot (see pic): Ten stars. depp vs sheen seems impossible but true. "hate as in...i wish he died earlier in the film"
"you my friend are ever quotable"
^So you haven't seen Dafoe play the nicest guy of all? He played Jesus you know hehe. ^haha. how...judgmental. haha. that movie was The Last Temptation of Christ, directed by Martin Scorsese. well, i sort of agree with you. his face does look a bit mean.